The club owns 2 boats for a total capacity of 38 divers. The bay of La Ciotat, whose the “green island” is the queen, allows us to shelter from different winds most of the time. It then guarantees the vast majority of dives. Do not forget to taste our traditional hot tea when back on the boats! 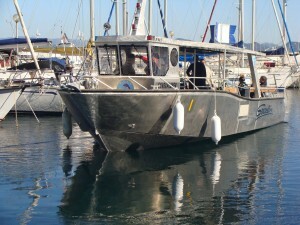 Speed and ideal to bring a small group of divers to the bay diving sites.